Doing my weekly Shopping, when suddenly the woman next to me was at her breathe, screaming on a vendor and the vendor on the otherhand was screaming back. I really didn’t get their issue though, all I heard was, ayaw panakit! (don’t hurt!) hhehehe hope my translation is right, I mean the woman says, “Don’t hurt people”. I do not have that chismosa (gossiper) nature and so I head on and bought pork meat and just saw the woman leave and the vendor was still on a loud voice like “I can go back to jail just to get back on you” Nyah! Scaryyyyy.. maybe he was just kidding and then I continued my shopping. Bought some squid, sea weeds (latu) like the green thing. Then some veggies and hurried home and cooked some adobong pusit with oyster sauce. Yummy! That’s it for the day! And good news, I’ve decided to put on some Bisaya – English Translation relevant to my post. In tagalog Halloween is called Undas, here in Mindanao its called Kalag-Kalag. Kalag means ghost and kalag-kalag means ghost-ghost, no! was just kidding. That is just how they call them so we follow with no questions. He he he. We spent kalag-kalag at my place in Mati, Davao Oriental, where beaches are clean. But we didn’t go home to swim. We had a little lunch at my moms grave last November 1, 2008. My Uncles, Aunties, Cousins, Lolo Marcelino, Lola Presentacion and the rest of the gang hehehehe were there enjoying a 15 kilo litson with kinilaw and crab. Yummy! With the scent of the cemetery, hmmmm air was so naturally decaying? hehehhe joke!. We were at the public cemetery and not on private ones, just visualize how it looked like. But the feeling of peace and love from my family is like of the old times. If you have followed the last post I did, I said I don’t normally go home for several reasons that is why I enjoyed the moment with my mom rested and my relatives having a little chitchats. That’s it for kalag-kalag 2008. 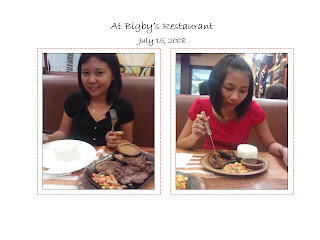 Melody Anne and I had dinner at Bigby’s Restaurant in SM, Davao City last night. It was fun because before you can actually enter the restaurant and be on your seat, crew overwhelms you with their accomodations and politely gives you their menu and offering you their best sellers. Two tables away from ours a customer was celebrating its birthday. The crew gave her a warm blessing and a jolly birthday song with a cake and a candle on top of it. We were sort of part of them even as audience. It tooked us hours hehehe exaggerated rather it tooked us several minutes before we have actually placed our orders. 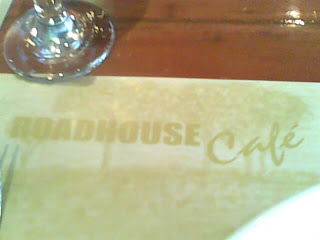 With mine, I had Pork Steak with veggies on the side and it costs me 219 PhP. Real expensive but worth the taste. I Admit to have sinned gluttony, I was full then, but I have to finish my meal. Even Melody Anne was exhausted after finishing hers. As we stand to vacate the place, as if we cannot move due to fullness and were laughing to ourselves. 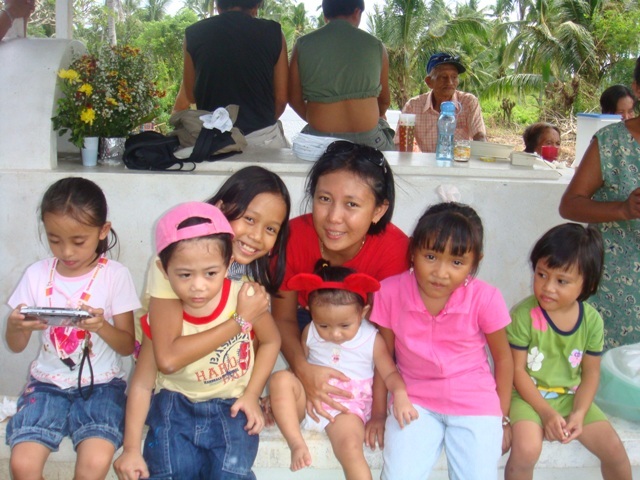 We went to Laak, Campostela Valley for MinSSAD Sub-Projects Turnover last July 1, 2008. A ride from Davao City is about three hours on a long rough road. My back is a bit aching due to humps of the road but is certainly a real great ride. One thing that I remember most about the trip is the experience of boodle fighting. The fight isn’t like that of boxing. Boodle fighting is a military style of eating.Three long table were prepared and food are on top of the banana leaves. Viands and rice ready to eat using your bare hands. Of course jugs of water are prepared on the side for us to wash our hands before the combat. With the signal to start the boodle fight everyone had their position. Yeba! Ready get set, go! Meriendas served before the Boodle Fight! Sizzling Pochero. Its gravy is unexplainably delicious with its brownish color really mouth watering. 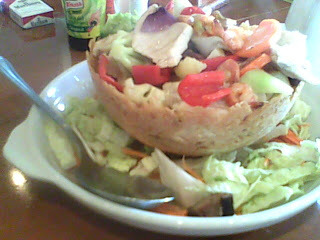 Above photo is the seafood vegetable basket. 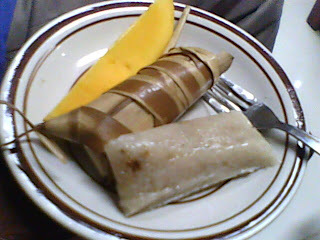 yum yumm yumm Suman (A Filipino Delicacy) and a Ripe Mango at the side. Suman is made from rice (malagkit). Frankly, I don’t know how they prepare them. 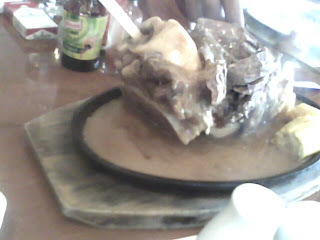 You will see this food during fiestas on the barrios or on special occassions specially at provinces. Photo above was taken at Dujali, Davao Del Norte, Philippines right at the room of the Mayors Office. I didn’t have a good shoot with the “chokolate” prepared from tabliya. 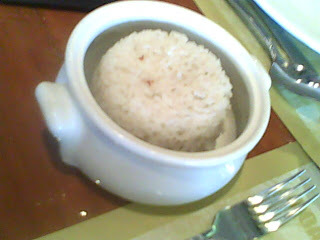 They served it as our meryenda (snacks). I prepared spicy tuna Carbonara yesterday. I still have some left in the refrigerator for some afternoon snacks. Put some butter or oil to what you prefer. Pour on the white sauce on the noodles. Then mix. Garnish it with finely chopped spring onions and the sausage. There you go.. Enjoy your Spiccccy hot Carbona. Got this recipe from lottie and billie jean.